Thunderball possesses a genius level intellect and is a gifted strategist and physicist, specifically in the field of Gamma Radiation. He is also a formidable hand to hand combatant. He utilizes street-fighting techniques that enable him to make full use of his strength. Enhanced Abilities: Asgardian magic has enhanced Thunderball’s strength and his endurance. Body Armour: Thunderball’s flesh has been toughened by Asgardian magic. This provides him with some protection against physical attacks and limited protection from energy attacks. 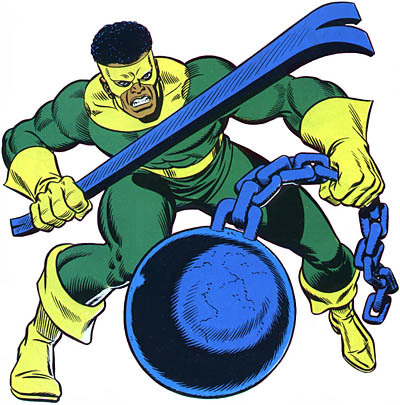 Weapon: Thunderball carries a steel Wrecking ball on the end of a short chain, which he wields as a weapon. The ball is enchanted and returns to Thunderball’s hands when thrown. Resistances: The Asgardian enchantments have provided Thunderball with some resistance to cold, heat, fire, corrosives and toxins. Dr.Eliot Franklin's most notable achievement before being imprisoned was the construction of a Gamma bomb similar to the one created by Bruce Banner. While in prison Franklin joined up with the other members of the Wrecking Crew. They all acquired their powers from the Wrecker's Crowbar. All four convicts escaped prison together and were able to obtain the Crowbar. Frankiln grasped the Crowbar with the others and as lightning struck it the Asgardian magic was released and shared by the four and Thunderball was born.